Madhya Pradesh Recruitment 217. Candidates full fill all eligibility criteria such as age, educational and other qualifications are required to submit applications through online only. Online application process begins from 12-October-2017 till 12-November-2017. After the process of recruitment selected candidates will be offered Rs. 8100/- to Rs. 18070/- per month as per rules. Minimum age limit of the applicants should be 18 years to 25 years as on 01-10-2017. The process of selection is based on written test and followed by Physical Endurance Test (PET). The detailed pattern of selection process will be mentioned below. Application fee for FCI Watchman Recruitment is Rs. 300/-. Last date for application fee payment is 12-11-2017. For more details of Application procedure, Selection procedure, Admit Card, Application fee payment, Age limit, Pay Scale and other details of Food Corporation of India FCI, Madhya Pradesh Watchman Jobs recruitment are mentioned below. 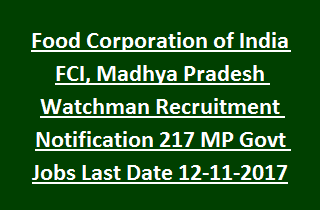 Total available Watchman Jobs in Madhya Pradesh FCI Recruitment are 217 posts. Post Name: Watchman: 217 posts. Qualifications required for Watchman Jobs is 8th (Middle) standard pass (as on 01/08/2017). Minimum age limit for FCI, MP Watchman Jobs is 18 years and maximum age limit is 25 years as on 01-10-2017. Age relaxations applicable as per Madhya Pradesh FCI Govt Rules. Selection process for FCI Watchman Jobs is based on written test and followed by Physical Endurance Test (PET). Written test will comprises of 120 MCQ type questions. Duration of Exam is 120 minutes. -General Knowledge/ General Awareness: 30 questions, 30 marks. -Reasoning: 30 Questions, 30 marks. -General English: 30 questions, 30 marks. -Qualitative Aptitude: 30 Questions, 30 marks. Pattern of Physical Endurance Test (PET): Qualifying purpose only. Short listed candidates and Venue of PET/ written test and other details will be informed through FCI website @ www.fciregionaljobs.com and www.fcimpapply.com. Application fee for SC/ ST/ PWD candidates is Nil. Application fee for other candidates is Rs. 300/- paid through Internet Banking, Debit/ Credit Card or E- challan at any SBI Branch. Candidates who are willing to apply for Watchman Jobs are required to send applications through www.fcimpapply.com. Attach the relevant documents along with application form. Submit the final copy of application from 12-10-2017 to 12-11-2017.